There are some excellent private tour guides available in the Kerry area. 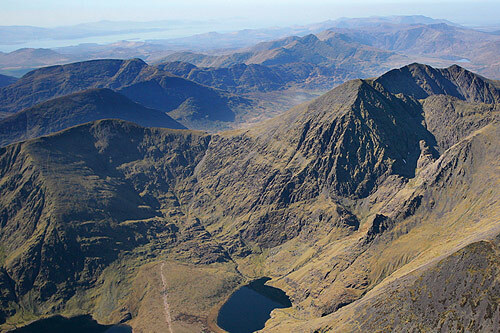 The McGillycuddy Reeks – or Na Chruacha Dubha (the black stacks in Gaelic), are Ireland’s highest mountains. They form an east-west ridge that has several peaks over 3000ft (914m) in height, including Ireland’s highest mountain Corrán Tuathail. Gap of Dunloe guide Con Moriarty, his son Naoise (inset), along with other associate guides, have been climbing and exploring, learning and sharing the rocks, nature, history, culture and lore of these mountains for many years. This tradition that has been in the Moriarty family since the mid 19th century. It is an experience shared with individuals and small groups that is likely to remain a highlight of time spent on the pinnacle of Kerry for years to come.